Data Governance is not just data security and protection. Nor is it data protection, records management, data retention, IT Governance or Corporate Compliance. And it is certainly not Big Brother. It is the cross-functional discipline of managing, improving, monitoring, maintaining and protecting data. In short, it is proactively managing your data to support your business. Is this data any good? What am I permitted to do with this data? Data Custodian - Responsible for the safe custody, transport, storage of the data and implementation of business rules. Data Stewards are responsible for what is stored in a data field, while Data Custodians are responsible for the technical environment and database structure. Common job titles for data custodians are Database Administrator (DBA), Data Modeler, and ETL Developer. Data Steward - A person responsible for the management of critical data elements - both the content and metadata. Data stewards are responsible for processes, policies, guidelines and responsibilities for administering organizations' entire data. Data Stewards are commonly responsible for data content, context, and associated business rules. Not full time role. Better to get more data stewards and divide up the work. There are many definitions of data quality but data is generally considered high quality if, "they are fit for their intended uses. Alternatively, data is deemed of high quality if it correctly represents the real-world construct to which it refers.A considerable amount of data quality research involves investigating and describing various categories of desirable attributes (or dimensions) of data. These lists commonly include accuracy (Common data problems like misspellings, typos, and random abbreviations have been cleaned up. ), correctness, currency (Up-to-date information is readily available to support decisions), completeness (All relevant data —such as accounts, addresses and relationships for a given customer—is linked.) Availability (required data is accessible on demand; users do not need to search manually for the information) and relevance (how well a retrieved data meets the information need of the user). Maturity Model - The term "maturity" relates to the degree of formality and optimization of processes, from ad hoc practices, to formally defined steps, to managed result metrics, to active optimization of the processes. Intended to improve processes. The business takes more ownership and accountability as data governance matures. Structural metadata is data about the containers of data and gives a description of how the components of an object are organized. Non-Invasive Data Governance - Term trademarked by Bob Seiner. 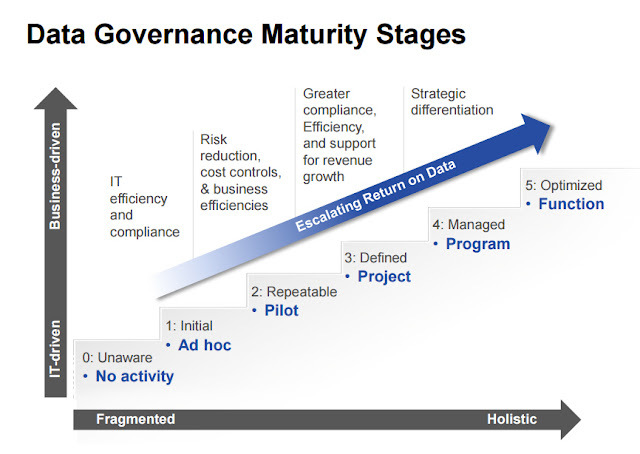 Every organization already has some semblance of Data Governance in place. It may not be referred to in this terminology, but there are people who oversee and organize data, individuals who define the data lexicon, and various processes that data goes through to be stored and accessed. By emphasizing the fact that an organization is already engaged in some variation of governance, Seiner believes that individuals can more readily gain the support of management by merely asking for its cooperation in formalizing and refining its current procedures to ensure uniformity and increased accessibility to data. Data Governance is not about data. The vision must be to improve the business processes, decisions and interactions trusted, secure data enables. Data is a Valuable Asset that must be broadly available, managed over time, and constantly improved. Beyond “business led and IT enabled”. Empower the business with data management tools. To promote data analytics as a core competency, working with data must extend well beyond IT. Basic Information Asset Questions. Where is it? Is any good? What does it mean? Senior Management Support - Many senior executives are unfamiliar with governance and are unwilling to dedicate resources to what they don’t understand, particularly when they don’t see the value in it. Metadata Repositories - Information governance practices must support the scope of metadata management you plan to implement. Frequently, repositories exacerbate the lack of sound information governance practices. What are the top business imperatives as defined by your most senior leadership? What organizational business processes, decisions and stakeholder (e.g., customer, partner, employee) interactions are most important in support of these top imperatives? What data and applications are used to support those processes, decisions and interactions? People - Give Governance Steering Committee members a job Data Governance team are teachers. Talking about data governance is boring, doing it is fun. IBM Information Integration and Governance - IBM InfoSphere solutions offer multiple entry points so you can adapt your data governance strategy and timetable to suit your organization, your data and the unique ways you use your business information. Informatica - Redwood City, CA - Master Data Management Tool, Profiling Tool,. Hub cleanse the data centrally if desired, Meta Data Tools. Its data quality products are Data Quality Standard Edition, Data Quality Advanced Edition and Data Quality Governance Edition, Address Validation Services and StrikeIron. SAP Information Governance Solutions - Create and manage guidelines and policies to ensure that information is maintained, secure, and retrievable. Measure data quality to meet complex requirements for modeling and simulation. And improve master data management (MDM) so that disparate sources can meet legal and regulatory compliance. Its data quality products are Data Quality Management, Information Steward and Data Services. Trillium Software - Burlington, Mass - Leading, global enterprise data quality solutions provider. governyourdata.com - Hosted by Informatica - is an open peer-to-peer community of data governance practitioners, evangelists, thought leaders, bloggers, analysts and vendors. Non-Invasive Data Governance – September 1, 2014 by Robert S. Seiner (Author) Data Governance should not be about command-and-control, yet at times could become invasive or threatening to the work, people and culture of an organization. Non-Invasive Data Governance focuses on formalizing existing accountability for the management of data and improving formal communications, protection, and quality efforts through effective stewarding of data resources.